Last May I had the chance to participate in an exciting competition to acquire a piece of contemporary art for the National Museum of Scotland. The event was Art Fund Collect, which is “an annual £75,000 scheme to bring outstanding contemporary craft to UK public collections,” running since 2008. Curators apply to have a work acquired for their institution, and this year nine of us made it to the shortlist, of whom five were successful. Art Fund Collect takes place each year during COLLECT, the leading international art fair for contemporary objects, which is organized by the Crafts Council. Before the event, applicants had to research the vendors showing at the event, and start thinking about which object they would like to nominate. At the fair, which took place in the Saatchi Gallery, Sloane Square, we were greeted by the organisers and then given one hour to walk around and make our selection. I curate the Museum’s collections of Japanese art and culture, and having to limit my possibilities to Japanese artists made the process a little easier! Nevertheless, there were many beautiful Japanese works to choose from. However, I had been captivated by a basket of woven bamboo, made by Buseki Suikō (Buseki is the family name). Entitled Crane Dance, it can be used in the traditional way as a container for flower arrangements (placing a watertight vessel inside to hold the stems), but it also stands on its own merits as a sculptural piece. Buseki comes from a family of bamboo artists, with both his father and grandfather being respected figures. He is the last traditional bamboo artist working in Tokyo, where he is based in the bustling shopping area called Yanaka Ginza. Crane Dance, by Buseki Suikō, 2009 (H. 37.5 cm, W. 24 cm). 1. Its beauty and high technical achievement. Buseki’s baskets are remarkable for their lightness and delicacy. He uses bamboo aged more than 100 years, painstakingly splitting it into strips of varying thinness, sometimes as little as 0.5mm wide. These he then weaves together in a process he likens to architecture, requiring precise planning to achieve both structural integrity and the distribution of pattern and colours. 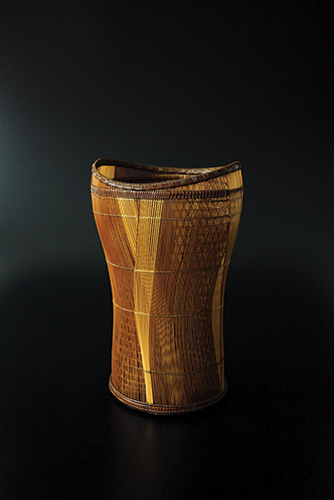 Buseki says that he seeks “not only to weave traditional basket forms, but also to capture the beauty of space that resides within the bamboo.” Crane Dance is an example of Buseki’s own weaving method, involving two layers, and the interplay between the inner and outer layers creates movement and decorative patterns. The rich amber colour is smoked bamboo (susudake), and the pale colour is natural bamboo (madake). He was inspired to create this piece by seeing cranes perform their mating dance in Kushiro, on Japan’s northern island, Hokkaido. Cranes are an auspicious motif in the East Asian visual tradition, symbolizing long life. 2. 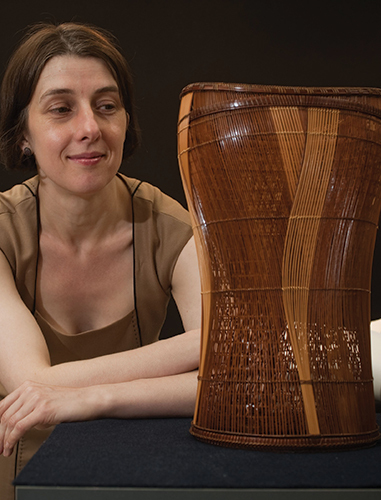 Bamboo is central to the craft traditions of Japan, but was not yet represented in the National Museum of Scotland’s collection. Since joining the institution in 2010 I have been keen to develop the collection of contemporary Japanese studio crafts, and this was a great chance. 3. This is the first of work by Buseki to be acquired by a museum outside Japan, and so an exciting opportunity for the National Museum of Scotland. While I was doing my PhD research in Japan, I lived in Yanaka, one of the “downtown” districts of Tokyo still redolent of eras past. I visited Suikō’s shop there in 2006 and purchased some small items. So it was a real pleasure to be able to propose one of his major works for a museum collection. Rosina with Crane Dance. Photo by Mark Crick, courtesy of Art Fund COLLECT. After making my selection, I had to stand by the piece, waiting for the selection committee to make their way round. I had about three minutes to explain why I wanted Crane Dance for the Museum, and then there were questions. With such wonderful works being nominated, it must have been hard for the committee to make their decision, but I was thrilled when the telephone call came through, telling me that I’d been successful. I had to pose with the work for the Art Fund photographer, and then the participants had a more relaxed chance to look round the fair at the private view that evening. Participating in Art Fund Collect was a very rewarding experience. It was instructive for me to research each of the Japanese artists being offered by the vendors, as there were many I was not previously aware of. It also prompted me to find out more about which artists are represented by other institutions in the United Kingdom. The research for Crane Dance also meant I did a lot of reading about bamboo craft, which I had not studied in any depth before. When I travelled to Tokyo in August, I was able to meet with Buseki, and ask him more about Crane Dance. 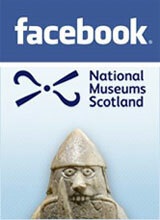 It is on show now for everyone to admire in the World Cultures galleries at National Museum of Scotland. Bamboo is an organic material and so can’t be safely displayed for more than three months, but we certainly intend to put this beautiful work out again in the future.